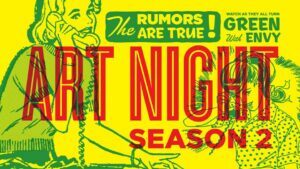 Every Third Tuesday | 6 PM - 10 PM | 1296 Jones St, Augusta, GA Every third Tuesday is Art Night at Pink Slips! We are rolling up the door at the corner of 13th and Jones for a second season. Come draw, paint, screen print or just hang with fellow creatives. All are welcome. Bring supplies and PLEASE RSVP! 21+ Visit the Facebook Event Page HERE!